This week’s KBTribeChat is all about the “Technicurean,” an emerging group of socially conscious consumers that are as passionate about cooking as they are about their kitchen technology — especially the latest products that can perfect their meal and ensure greater respect for their food. As self-proclaimed kitchen connoisseurs ourselves, we fully support that! So without further ado, let’s get to it! How do you define a gourmet kitchen vs. a chef’s kitchen? A chef’s kitchen is about efficiency and functionality, designed and equipped to satisfy the needs of the professional chef. A gourmet kitchen can be similar, but places a larger emphasis on design. Not only does it have all the gadgets, it’s also easy on the eyes! What is the most important feature in a kitchen for your clients? Countertops, of course! Kitchens are high-traffic, heavy-use areas, so surfaces should be carefully chosen to withstand such activity. Quartz countertops offer extreme durability and endurance - because no one wants second best surfaces in the heart of their home! What cooking technique is crucial for delivering accurate, consistent temperatures? Sous vide! It offers consistency, waste reduction, flexibility and will absolutely delight your taste buds (yes, Signature Kitchen Suite, we stalked your Instagram). What are the best design features for preserving the food? While the right fridge is key, a well thought out pantry is critical when you have a big family. New technology has also made it possible for appliances to have enhanced temperature controls, with cooling zones for specific food types, LED lights to imitate natural sunlight and air purification systems. The future is bright! Technicureans rely on technology to make cooking more convenient. What emerging kitchen technology trends are you most excited for? We can’t help but get excited about smart fridges, like LG’s ThinQ! Seriously, a gadget that lets you know when you’re running out of OJ or your milk is going bad? Count us in! What are some “must-have” design elements for a Technicurean’s kitchen? Since the Technicurean is all about respect for food, we’d say sous vide cooking equipment. Overcooked food, be gone! We also love the look and functionality of pop-up sockets and charging stations, especially if you use your kitchen for entertaining. After all, how are you going to Instagram all those hors d’oeuvres with a dead phone? What kitchen design solutions add a “Technicurean” touch? It’s all about integrating functional technology into the kitchen design, simplifying the cooking experience while staying true to the design and style. Smart appliances, fixtures and durable work surfaces bring a Technicurean kitchen to life. How do you integrate new appliances into a timeless kitchen design? Stick to clean lines and streamlined designs! 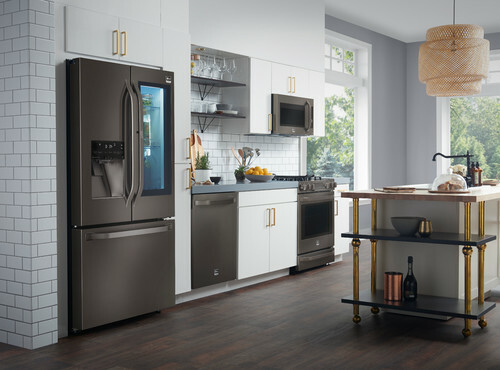 Not only will it make the space seem bigger and brighter, it can also help embrace a modern aesthetic that seamlessly integrates new appliances without losing the qualities you love in a timeless design.